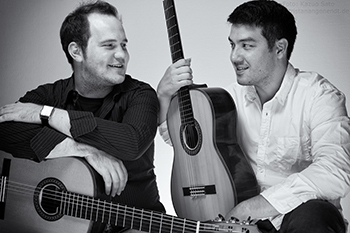 Born in 1985 in Wesel (Germany), Tristan Angenendt was regarded early as one of the greatest talents on the guitar in his country. In 1992 he received his first lessons with Günter M. Schillings at the music school in his hometown. At the age of only 14 years he was accepted to study in the renowned class of Prof. Hubert Käppel at the "University of Music and Dance Cologne", where he graduated with honours. Further studies with Aniello Desidero at the "International Guitar Academy" in Koblenz and masterclasses with most of the leading guitarists in the world (including Manuel Barrueco, Zoran Dukic, Eliot Fisk, Dale Kavanagh, Carlo Marchione, David Russell, Angel and Pepe Romero) complete his artistic education. He made his debut as a soloist with orchestra at the early age of twelve, followed by his first full solo recital in Lemgo (Germany) only one year later. Since then he is performing all over Europe and in South America, captivating both audiences and the press, who regularly praises his "brilliant technique", "great expression" and his "extraordinary diversity of sound". With his well-conceived, dramaturgically cleverly designed programs and a diversified, demanding repertoire, Tristan Angenendt is one of the leading ambassadors of his instrument in the German concert landscape. In addition to his career as a soloist Tristan Angenendt took part in several chamber music projects with internationally acclaimed musicians like Hubert Käppel, Takeo Sato and others. Among other formations, he performs regularly in a guitar duo with Austrian guitarist Martina Gruber since 2015. His debut CD "Between the Centuries" with 20th and 21st century works (including several world premier recordings) was published by KSG/Exaudio in 2012 and received consistently outstanding reviews in guitar magazines and publications, including "Akustik Gitarre", "Gitarre & Laute" (Germany) and "Gendai Guitar" (Japan). Live recordings and productions for national and international radio and TV stations complete his artistic activities and were broadcasted in 20 countries in Europe and Asia. Since 2007 Tristan Angenendt pursues a regular teaching activity and is currently teaching at the "University of Music and Theatre Rostock", at the music school in Langenfeld and at the "Guitar Academy Niederrhein" in Wesel, which he founded together with Martina Gruber. Students from his classes have already won numerous prizes in competitions. 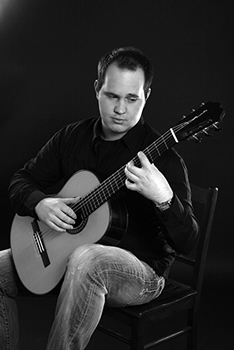 As a sought-after teacher, Tristan Angenendt is also regularly invited to give master classes at international guitar festivals and as a guest lecturer to various conservatories and universities in Germany and abroad. 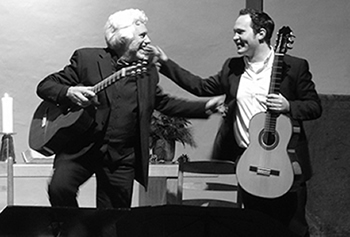 Between 2013 and 2019 he supervised the International Guitar Festival and the concert series "gitarrissimo goes klassik" in Oberhausen (Germany) as artistic director for classical guitar and served as a honorary board member of the cultural association "Gitarrissimo Oberhausen e. V.". Since 2018 he is member of the "Gitarreninitiative Niederrhein e. V.". Tristan Angenendt plays guitars by Andres D. Marvi (2000, Model "NG", Cedar), Kazuo Sato (2010, Model "Special", Spruce) and C. Claus Voigt (2015, Model "GranSolo", Spruce).